Save the PDF file to a location on your computer. The photographs and paintings in the La Lucha series serve as a springboard to learning and discussion for students at all levels. In viewing La Lucha/The Struggle, students will be able to observe and critique the different artistic choices made by the photographer and the painter. Concepts such as perspective, composition, and interpretation can be illustrated and explored. The La Lucha series gives students an extraordinary window into life in contemporary Cuba. 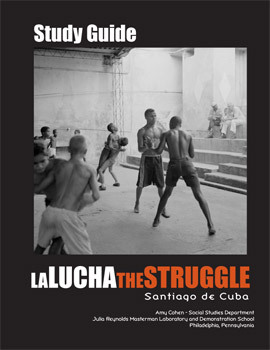 The visual content of La Lucha will motivate students to learn more about the country in which the photos were taken. Furthermore, this intimate view of Cuba provides the opportunity for students to reflect on the customs, values, and concerns that govern their own lives. A standards-based study guide containing lesson plans and additional resources is available as a companion to this book.